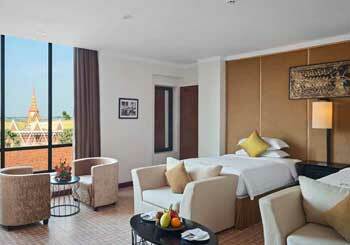 Located in Building B, the Apsara Deluxe & Suites range in size from 32m² . Carefully decorated in Angkorian style with tasteful interior design to reflect the country’s history and traditions. With a comfortable king sized bed, the Apsara Deluxe are your ideal respite from the hot and busy city. Facilities: minibar, sofa , cable TV, make-up mirror, hair dryer, wine selection comes with wine glass collection, air conditioning, telephone, free Wi-Fi, rain shower, bathrobes, safe, kettle, umbrella. Available as either twin or double rooms, and with a limited number of connecting rooms available (1 twin & 1 double), the Royal Deluxe Room are situated in Building A and range from 35m². With luxury designs and outfitted in palatial furniture, these are beautifully sumptuous accommodations that will make you feel at home. Facilities: minibar, sofa , cable TV, make-up mirror, hair dryer, wine selection comes with wine glass collection, air conditioning, telephone, free Wi-Fi, rain shower, bathrobes, safe, kettle, umbrella, non-smoking room. Available as either twin or double rooms, and with a limited number of connecting rooms available (1 twin & 1 double), the Royal Suite are situated in Building A and are 45m² in size. 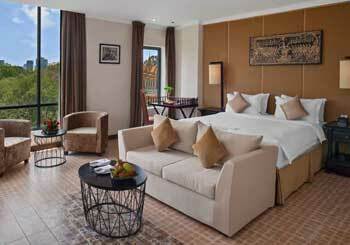 With the same high standards in interior design and furnishing as the Royal Deluxe Room, the Royal Suite also offer you a balcony to enjoy the view of the Phnom Penh skyline and/or the pool area. 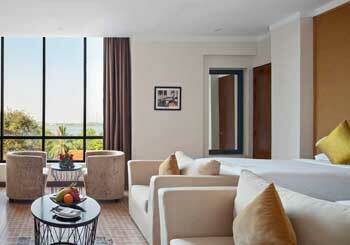 Located in Building B, the Apsara Deluxe & Suites range in size from 43m². Carefully decorated in Angkorian style with tasteful interior design to reflect the country’s history and traditions. 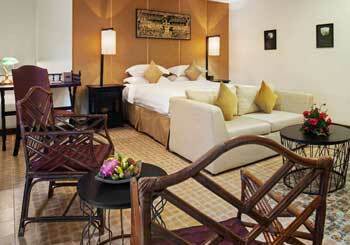 With a comfortable king sized bed, the Apsara Suites are your ideal respite from the hot and busy city. Situated on the fifth floor, these 54m² units provide wonderful views of either the Royal Palace or the river. With a king-sized bed and bathtub, these rooms will prove to be very popular. Designed and furnished to the same high standards found throughout the hotel, the Silver Units are your own mini palaces by the palace. The Royal Penthouse Two Bedrooms is one of a kind; 95m² of palatial extravagance with fantastic views of the palace and the river. With two double bed rooms complete with en-suite bathrooms, and with a separate living area, this provides you with a high level of modern luxury flavoured with hints of traditional interior design. Welcome to the Palace Gate Hotel & Resort, a new luxury hotel situated in the heart of the thriving and lively capital city of the Kingdom of Wonder. Only 11.5km from Phnom Penh International Airport, the hotel is located adjacent to the splendours of the Royal Palace and within a short walking distance of the bustling Riverside area of Sisowath Quay. 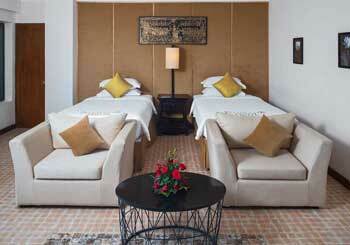 Palace Gate Hotel & Resort offers you luxurious accommodation in perhaps the city’s most convenient location. How often do you encounter a hotel where your neighbours are Royalty? To avoid the often chaotic choices of transport outside the airport, why not make use of our a/c limo pick up to bring you straight to the hotel. When you arrive, the first thing you notice about our hotel is our lovingly restored French colonial villa – perhaps one of the finest examples in the city – formerly the seat of power of the French colonial government. This stunning centrepiece, complete with ornate columns and wonderful examples of Cambodian tile making, serves as the home to our fine dining restaurant, Mealea. The restaurant offers both French Fine Dining or Royal Khmer Cuisine options, and our chef has created a range of culinary delights to please every palate. 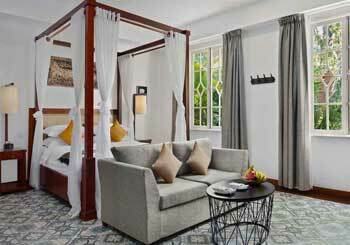 Combining deluxe modern accommodation with a traditional Angkorian feel, Palace Gate Hotel & Resort offers guests the chance to relax in a palatial oasis or to explore the resurgent Pearl of Asia. Choose from a range of carefully designed rooms, have some time out by the pool, sip cocktails at our rooftop bar surrounded by the greenery of our unique organic herb and vegetable garden which supplies Mealea, or use the hotel as your base for sightseeing trips around the city and beyond. Guests can also choose from an extensive range of treatments provided by experienced therapists in our spa facility or use our well-equipped gym. Please take some time to explore our room options and facilities, and to see what Palace Gate Hotel & Resort can offer you. Our highly trained and attentive staff look forward to welcoming you soon.